The offer with cheap apartments in Belgrade consists of a whole selection of apartments for daily renting, and when we say “cheap”, we primarily mean the price/quality and price/capacity ratio. We will first give you an overview of the apartments located in the city center, and afterwards, the apartments located in the areas of Vračar, New Belgrade and other locations, such as Voždovac. We have picked some of the apartments with the price range from 25-40 eur/day, and bear in mind that all the presented apartments are studios, with the capacity of up to 2 persons, making them ideal for couples, except for the apartments Stela, Metro and Zira 2, which are also studios, but have the capacity of up to 4 persons, apartment Šumatovac, which is a two-room apartment with the capacity of up to 3 persons, apartments Stefan and Slavija Zen which are two-room apartments with the capacity of up to 4 persons, apartments Djeram and Belgradenook which are two-room apartments with the capacity of up to 6 persons, and the apartment M, which is a three-room apartment with the capacity of up to 4 persons. Apartment Silver is located in Cvijićeva street, and is a 15 m2 studio with a bathroom. The studio has modern interior, with all the functionalities, such as air-condition, Wi-Fi internet, LCD TV etc. Perhaps one of the biggest advantages of this accommodation is free parking spot, always available for the guests. Apartment Dorćol is located in Visokog Stevana street, in the area of Dorćol, so the city downtown is only 10-minute walk away. Strahinjića Bana street, famous for its night life and the Danube Quay are also nearby. This apartment has all the amenities as it is structured as a hotel room. Apart from the price, the biggest advantage of this accommodation is its location. Apartment Pink is located in Kraljice Natalije street, and the location is what makes it so appealing. Kraljice Natalije street is very close to Zeleni Venac bus terminus, which makes you well-connected to all parts of the city via public transport, and it will only take you a 5-minute walk to get to Knez Mihailova street and the Republic Square. This pleasant apartment has another advantage, which is free parking in the back yard of the building it is located in. Apartment Pionir is located in Despota Stefana Boulevard, right next to Pionir Sports Hall. It will take you 20 minutes to get to the city centre on foot, and another advantage is that it is well-connected to other parts of the city, both by bus and BG train service, and there is also Pančevo bridge located nearby. This apartment has a number of advantages: apart from its nice interior, it is very quiet and peaceful, and there is also a balcony, and the most importantly, free parking. Apartment Pleasure 2 is located in the very same building as the apartment Pink. Whatsmore, there is another apartment in the building – the apartment Pleasure, so all three apartments can accommodate up to 9 people in total, which is particularly convenient for larger groups in need of a more private setting. Apart from the location, comfort, modern interior and equipment, what makes all these apartments stand out is the luxury wellness center inside the building. There is also free parking provided inside the building back yard. Apartment Momento is located in Majke Jevrosime street, in the very center. Knez Mihailova street, Terazije street, Nikole Pašića Square are only at the hand’s reach, a minute or two of walking from the apartment , so you won’t need to use any public transport. Apart from its central location and affordable price, the apartment is fully equipped and offers comfortable and convenient atmosphere. Apartment Mint is located in Cvijićeva street and has all sorts of amenities, such as: LCD TV, Wi-Fi internet, air-condition, etc. City centre is 15-minute walk away, or a 5-minute ride by public transport. The greatest advantage of this apartment, however, is free parking. Apartment Mala Kasina is located in the strict city centre, in Terazije street, right across the Old Palace. The location is therefore its biggest advantage: all tourist sites are in immediate vicinity and you won’t need any kind of transport, as all you need is at hand’s reach. The apartment is very comfortable and has charming interior with a fully-equipped kitchen. Apartment Stela is located near the Autokomanda area and the Red Star stadium. Although the location does not seem so central, the advantage of this apartment is its peace and quiet surrounding, as Jove Ilića street is one of the most peaceful streets in this area. The Serbian Clinical Centre is also nearby, so this apartment is very convenient for all those who come to Belgrade for treatment. The location is very well-connected with other parts by means of public transport, and the free parking is possible in front of the building. Apartment Metro is located right next to Tašmajdan park, in Kralja Aleksandra street, and you can easily get to the city centre and the Monument of Vuk and Vračar area. The biggest advantage of this apartment is that, in spite of being a studio, it can accommodate four persons, as you can use the double bed and a fold-out couch. This is what makes this apartment one of the most affordable ones in our offer. Apartment Stefan is located in Despota Stefana Boulevard, only a couple of minutes away from Skadarlija street. It will take you 15 minutes of walking to get to city centre, and even less if you get on a bus. Unlike all previous apartments which are studios, apartment Stefan has two rooms, with a separate living room and a bedroom, hall and bathroom, so it can accommodate 4 persons (double-bed + fold-out sofa). One big advantage is that if you book this apartment for 4+ nights, the transport from the airport to the apartment comes free of charge. Apartment Galerija is located in Žorža Klemansoa street, immediately leaning on Francuska street. In less than 10 minutes of walk, you can reach the Republic Square and Knez Mihailova street, and Skadarlija street is literally at hand. Also, in the immediate vicinity is Strahinjića Bana street, which is a synonym for Belgrade night life. Apartment has lovely interior and is located in a building with video surveillance and security staff. In case more persons are arriving, there is an identical apartment in the same building, so the accommodation is possible. Apartment Zira 2 is located in Dimitrija Tucovića street, near the shopping center Zira and the monument of Vuk, and the City Hospital is also nearby, so this apartment is very convenient for all those who come to Belgrade for treatment. It will take you around 20 minutes of walking to get to the city centre. The biggest advantage of this apartment is that, in spite of being a studio, it can accommodate four persons, similar to the apartment Metro above. Apartment Šumatovac is located in the heart of Belgrade downtown, more specifically in Kondina street, very near the Politika building. Knez Mihailova street, the Republic Square and Skadarlija street are only two minutes of walk away. This apartment has two rooms and can accommodate up to 3 persons, which makes it very cheap, when compared to the location. Apartment Šumatovac is very peaceful, although located in the city centre, and there is also a LED TV, desk with a computer and a fully-equipped kitchen. Apartment M is located in Vladetina street, near the Tašmajdan park. The biggest advantage of this apartment is that it has two rooms and can accommodate four guests. In addition to the two bedrooms with a double bed and double fold-out couch, this apartment, among other amenities, also has the terrace with garden furniture , fully-equipped kitchen, central heating, Wi-Fi internet, cable TV and security lock door. Apartment Đeram is located in Jedrenska street, behind the Djeram market, very near Kralja Aleksandra Boulevard. This two-room apartment has exceptional interior and is one of the most affordable in our offer, as for 38 euros, it can accommodate up to 6 persons. The bedroom has a double bed, and the living room has two fold-out couches. Also, the apartment has a big terrace, ideal for relaxation and one part of Jedrenska street offers free on-street parking. Apartment Belgradenook also belong to the category of cheaper apartments. This apartment has two rooms and can accommodate up to 6 persons. Belgradenook is located in a very fine location, in Dorćol, more specificaIly, in Cara Uroša street, so the city centre is reachable within minutes, as well as Strahinjića Bana street, famous for its night life. Kitchen and bathroom are fully equipped, and the apartment is spacious with pleasant atmosphere. Apartment Slavija Zen is located near Slavija Square and Tašmajdan area. This apartment has two rooms and the capacity of 4 persons. St Sava Temple and Serbian Clinical Centre are very near, and it will take you 20 minutes of walk to get to city centre. The apartment is fully equipped: Wi-Fi, air condition and two TV sets. Apart from a very favourable price/capacity ratio, the big advantage of this apartment is a free parking spot in the building back yard. Apartment Džem is a studio apartment with a size of 22m2, located in Smiljanićeva street in Vračar area. It is suitable for two persons, and nearby you can see St Sava Temple, Slavija Square, Yugoslav Drama Theatre and Serbian Clinical Centre. The city centre is 10-15 minutes of walk away. The apartment has all the amenities, so it comes as exceptionally cheap. Apartment Sveti Sava is near St Sava Temple, the building it was named after. Its advantage is the excellent location, as it is set right in the heart of Vračar area: St Sava Temple, Nikola Tesla Museum, Serbian Clinical Centre and other relevant locations are right at hand. The apartment was fully refurbished in August 2015, has decent and pleasant interior, as well as other relevent amenities, so it comes as cheap for both longer and shorter stays. The apartment is a studio and can accommodate 2 persons. Apartment Marmelo is located in Crveni Krst area, a well-known Vračar area on the very border with the area of Zvezdara. A great advantage of this studio is the fact that it is located in a very peaceful neighbourhood, making it suitable for couples in need of privacy and peace. The apartment also has LCD TV and a bar. Belgrade Drama Theatre is nearby, as well as a large number of restaurants and cafés. If you get on the trolley bus, you’ll get to the city centre within 10 minutes of driving. Possibly the biggest advantage of this apartment is the free parking spot. Apartment Orange is also located near St Sava Temple, more specifically, in Šumatovačka street, and all the locations above surrounding the Temple are nearby. This apartment has two rooms and can accommodate three or even four persons, as there is a fold-out couch. The kitchen and bathroom are fully equipped and the interior is very nice and pleasant. The biggest advantage of this apartment, apart from its location, is the free parking spot in front of the building. 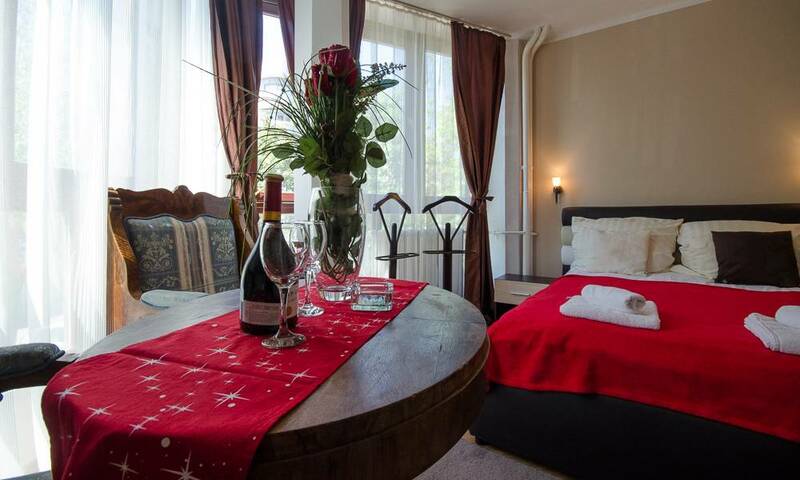 Apartment Čubura is possibly our cheapest apartment as it belongs to a group of three-room apartments and can accommodate up to 7 persons, so the price/capacity ratio is very favourable. This apartment is located in the area of Čubura, a picturesque part of Vračar, very near numerous cafés and restaurants. The apartment has its own entrance, two bedrooms and each of them has its own LCD TV and a double bed. In addition, the living room offers two fold-out sofas. In addition to all the amenities (Wi-Fi internet, air condition, washing and drying machine), this apartment has remote controlled roof windows. Apartment Oton is located near the Fontana neighbourhood, in Otona Župančiča street. The price is 25 eur/day. This studio offers the capacity of up to 2 persons and is very near the Institute for Mother and Child, Zemun quay and Old Mercator. Oton has all the amenities: internet, TV, air-condition and security lock door. The biggest advantage of this apartment, apart from its price, is free parking. Apartment Kennedy, with the price of 30 eur/day, is a studio and intended for two persons. It Is located near the Zemun quay, which is perfect for walking and relaxation. The interior is lovely and the apartment has all the amenities, such as a TV set, internet and washing machine. It is very well-connected to other parts of the city by public transport, and the biggest advantage of this apartment is free parking. Apartment Senza, with the price of 30 eur/day, is located in Miklošičeva street in the area of Voždovac. This is a studio with very nice interior, with the capacity of 2 persons. This location is near the area of Vračar, so it will take you around 10 minutes of walking to get to St Sava Temple. The apartment is fully-equipped, and kitchen comes within the living room. Considering all of the above, this apartment is exceptionally functional and pleasant, and all the details were taken care of. Whichever apartment you may choose from this extensive offer, we wish you an enjoyable stay!